What kind of broker is FGMarkets? What security do I have when trading with FGMarkets? What type of trading accounts does FGMarkets offer? I’m a novice forex trader. Can I use FGMarkets? FGmarkets is a domain operated by FiveCircles Ltd, to offer the investment service of reception and transmission and the ancillary services of granting credits or loans to clients and foreign exchange services in connection with the provision of investment services.al schemas. 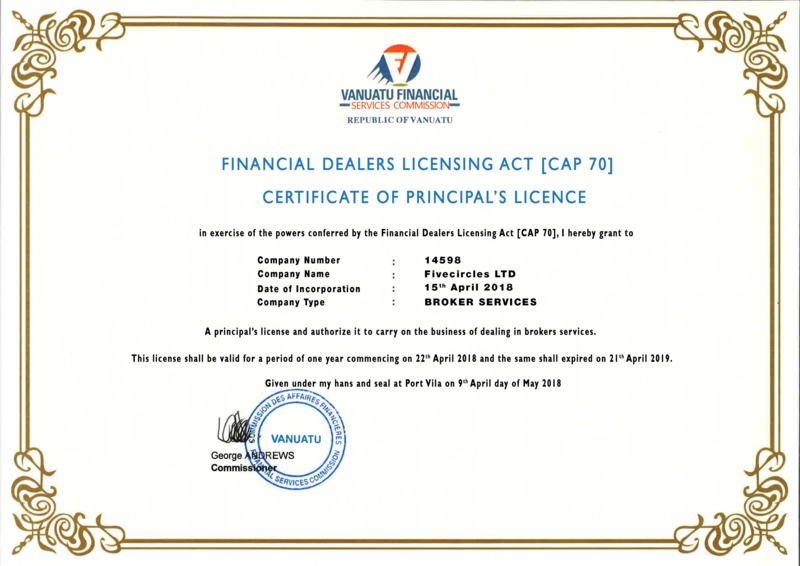 FGmarkets is an STP broker. Straight through Processing (STP) means, that all information about market are provided by liquid providers (banks, other brokers), which means, that conflict of interests between client and broker is not existing. FGmarkets is receiving remuneration only for the provision of margin to the end customer, and not receiving benefits from client’s loss. At FGmarkets we understand that the security of your funds is a primary concern. Rest assured that we consider the implementation and strict adherence to financial guidelines – both internal and external – a top priority, and concrete safeguards are built within the system to ensure an efficient trading experience. FGmarkets offers 4 types of trading accounts: FG Slate, FG Prime, FG Elite and Demo account. To learn more about account types, please visit the Accounts page. From beginners to professionals FGmarkets services all levels of Forex traders! Providing 24/7, multi-lingual support, FGmarkets offers a flexible platform with powerful tools to assist you in all your online trading needs. What is the minimum deposit amount for online trading with FGmarkets? The minimum amount to open a FGmarkets account is 100 $/€/£. In order to withdraw funds from your account you must maintain your margin requirements in case you have open positions. If you request a withdrawal of funds from your account and we cannot comply without closing some part of your open positions, we will not be able to fulfill your request until you have closed sufficient positions to enable your withdrawal. Please Note: In compliance with international anti-money laundering regulations, FGmarkets is allowed to transfer funds only to a bank account or a credit card bearing your name which was used for your initial deposit. The credit card copies should be provided upon registration and approved by FGmarkets compliance department. FGmarkets is allowed to transfer funds only to a bank account or a credit card bearing your name which was used for your initial deposit. The credit card copies should be provided upon registration and approved by FGmarkets compliance department. If your Account Manager is unavailable, our support team will be on hand to answer your questions. Rest assured that there is always a staff member available to take care of all your needs. Feel free to contact us anytime at support@fgmarkets.com. What documents are required to open FGMarkets account? Does FGMarkets charge any commission and/or trading fees? Does FGMarkets deduct any amount from my account for tax pruposes? Designed with you in mind, opening a FGmarkets account is easy. Simply click on the open trading account link and fill in the required information page. FGmarkets will consider accepting corporate accounts; however, corporate accounts will only be accepted after undergoing and passing a rigorous compliance process. If you are interested in applying, please contact support@fgmarkets.com for further details. FGmarkets DOES NOT charge any commission or fee as a result of your trading. FGmarkets is compensated for its services through the Bid/Ask spread. FGmarkets does not deduct taxes from client accounts. It is the individual client’s responsibility to handle his or her own tax obligations in accordance with local law. No. FGmarkets does not manage funds for its clients as this may create a conflict of interest. In order to remain 100% impartial, and always have our clients’ profit and interest in mind, we do not manage funds. FGmarkets clients can trade using a leverage of up to 500:1, depending on the asset they wish to trade and the trade size. Leverage of 500:1 means that a client is able to open a position, which is up to 500 times the size of his or her deposit. What are the recommended system for FGMarkets trading? FGmarkets MT4 WebTrader: a user friendly web platform, which synchronizes all trades with your MT4 account. FGmarkets Mobile &Tablet Trader: a tablet and mobile optimized trading platform fully synchronized with your MT4 account. Margin call is at 100% of margin level. If you reach margin call, then you will be addressed either to close some of your open positions or make deposit to strengthen your current open positions. Stop out is at 50% of margin level. If your margin level decreases to 50%, your positions will start automatically closing. First are always closed positions with the highest loss. Stop Loss orders are used to reduce risk by closing a losing trade once a market passes a trigger value pre-determined by the trader. FGmarkets will do its best to fill your trade at the price requested. However, because the order will close your trade at the best available price once activated, the Stop Loss is exposed to a gapping market. For the sake of absolute transparency, this means FGmarkets cannot guarantee a Stop Loss.